THE IMPORTANCE OF RIB CAGE CLOSURE. This (along with lots more!) is one bit of technical advice I try to instill in my clients and also advocate across niix. It’s so important for BETTER POSTURE, REDUCING BACK ACHE, WORKING OUT FROM A SAFE PLACE and you will get a SLIMMER and more TONED waist much more quickly and easily. Without correct connection of your ribcage, you are unable to workout with correct alignment and a connected and strong centre. Yes you may have pelvic floor and lower abdominal connection but by also encouraging ribcage closure, your centre will be fully engaged. And why is that? – believe it or not our abdominals connect to our lower ribs!💥By having correct placement and activation of your ribs (along with your pelvis) you will be in neutral alignment, which is the strongest and most aligned spinal position. Without ribcage closure you are not fully working your centre and will potentially compress your lower back or compromise yourself by over recruiting back muscles or hyper extending joints. When working out and particularly on the heavy/exertion element of an exercise, if all of the above is active you will be working from a stronger place and challenging your core more. Engaging your centre includes your pelvic floor (envisage a zip doing up from back to front and holding pee!) and a gentle connection of your abdominals, (with a sense of them wrapping around you to inward like a corset) and your rib connection!! 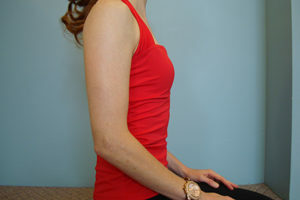 Using your out breath (core breath) will aid in a deeper connection and allow the ribs to draw softly down towards your hips. When POST NATAL this is even more prevalent as your ribs will have opened during pregnancy. Focusing on rib cage closure, will help draw your ribs and abdominals back and ensure you are exercising from a stronger and safe centre. If you want a smaller waist and bra circumference this is the way forward! This simple exercise demonstrates the use of your centre and ribcage closure whilst lifting your arms and mobilising your shoulder joint. If your ribcage lifts up when you raise your arms over your head, that may also indicate tightness or potential weaknesses in your shoulder. The same movement pattern also indicates lack of strength in the abdominals and tight back muscles. Keep your eyes peeled for exercises to help this.